Few sights are as breathtakingly beautiful to a horse lover as that of horses running free. Some tame, or trained, horses have that privilege in their owners’ large pastures, but wild horses in this country -- mustangs -- get to do it on thousands of acres of pasture land owned by the U.S. government. Millions of mustangs and donkeys, commonly called burros, used to run free in the U.S., but now there are likely fewer than 30,000 of both combined. A government program gives mustang lovers the chance to own these amazing beasts, but safe and proper training is essential. The mustang’s ancestors were Spanish, but over time they mated with other breeds owned by early settlers. Native American tribes relied on the mustangs, and when bred with large draft horses that were used for hard work, they became sturdy riding horses for settlers and soldiers alike. Mustangs travel in herds with each herd containing about 10 horses. The herd has two leaders: a stallion -- the daddy of the herd -- and the "boss" or alpha female horse. Most of the other herd members are also females, or mares, but the stallion leader may allow a few other stallions to stay in the herd. Many times herds will join up and travel together. As the population increased, particularly in the Western U.S. where most of the mustangs ended up, so did other animals like cattle and sheep. These livestock also needed to live off the land and began to compete with the mustangs for food. Mustangs are a hardy horse, and they know how to survive, even in harsh conditions and on a diet of grass and brush. The strong herd protection of the mustangs means there aren’t many natural predators, so their population grew so large that ranchers started to take matters into their own hands. 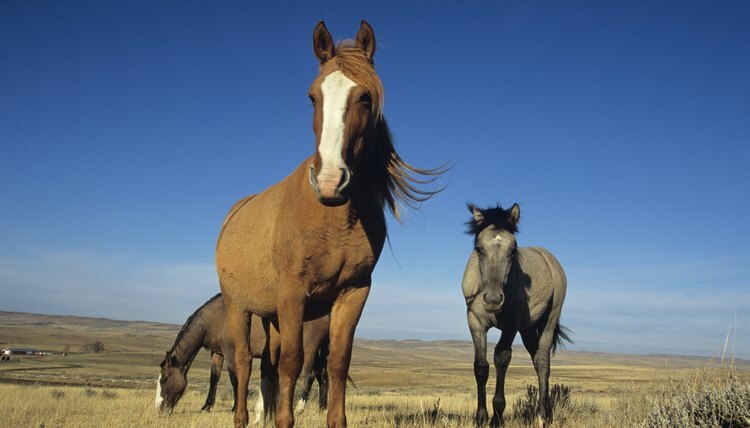 In 1971, the federal government passed a law to protect the mustangs, and designated the Bureau of Land Management as the overseer of the mustang. In 1973, the BLM started an adoption program. It rounds up and captures the mustangs and holds adoption events available to the public. This is your opportunity to own one or more of these horses if you can prove that you can properly care for them. As of 2015, the BLM adoption fee was $125. Anyone adopting a mustang has to be at least 18 years old. Because the mustang is a wild animal, you have to bring him to a facility -- a barn or pasture -- where he will be safe, but small enough so you can catch him for handling and training. Remember that these animals are not used to being held in captivity, so their instincts will be to escape and run free. Transporting the animal from the adoption event to your home should only be done by an experienced handler and transporter; many traditional horse trailers will be too confining for mustangs so the BLM requires a more open stock trailer. You need to care and train for the horse for one year with a follow-up assessment by a professional trainer, veterinarian or other horse professional, before the BLM officially gives you the title to your horse -- indicating, finally, that he is yours. Unlike a domestic horse born at home, a mustang has never been handled until rounded up by the BLM -- which is a frightening event for him. He has also been separated from his herd, the only family he has ever known. This doesn’t make him untrainable, but it’s vastly different from a horse who is used to humans. It’s important that you hire a professional trainer to help you establish trust with your mustang. Once that is done, mustang owners report that these horses will work hard and be extremely loyal, but it takes a great deal of patience -- you are reversing years of self-preservation among a wild herd animal. These strong survival instincts and years in a herd also make them excellent mounts if trained correctly. They are so intelligent they can sense your emotions through your energy and body language. They had to learn manners and how to exist socially in a herd so the herd leader would protect them. Once you establish yourself, firmly but fairly, as your mustang's leader, he will please you because he trusts that you will protect him now, too. Mustangs are very hardy. While not very tall -- about 14 or 15 hands -- most are typically stout enough to easily carry an adult. Most are “easy keepers,” meaning they don’t require a lot of feed to stay healthy. They also typically have good feet. A healthy mustang may live to the ripe old age of 40. Napa Mustang Days: Mustangs 101: What Are Mustangs and Burros? Where Does a Donkey Live? What Country Introduced Cattle to the U.S.?